One recipe, two names: malfatti (badly made) in Siena, gnudi (naked) in Florence. The result is still guaranteed, whether you want to speak in the language of Tozzi* and feel yourself in the center of the world in the Piazza del Campo, or you want to use the spoken language of Pratolini**, and get lost in the streets of San Frediano. Malfatti, because their characteristic is to be irregular, different, home made and a bit lumpy. Gnudi because they are ultimately the filling for ravioli, without the external dress of home-made pasta! 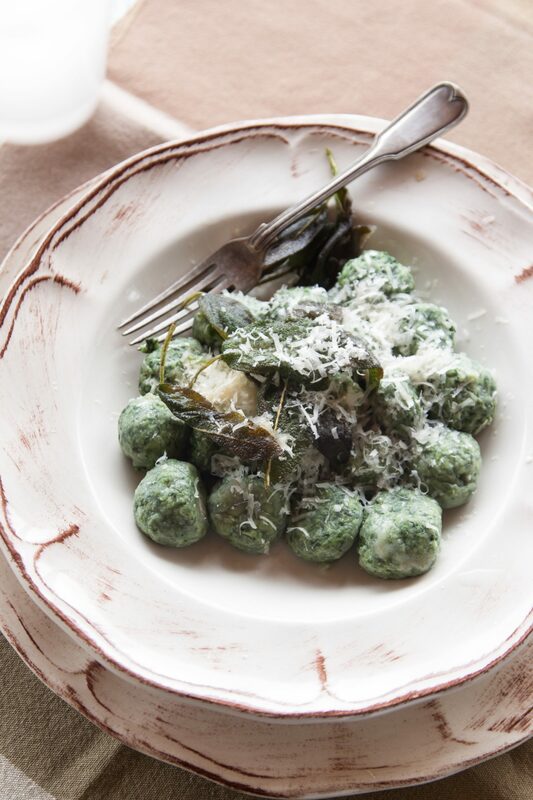 However they are called, these dumplings of spinach and ricotta are characterized by the same easy execution and certainly by the same deliciousness: they are good and simple, their few ingredients remind us of family dinners, of women around a table who move their hands automatically and wisely, while the words fly and go to pay a visit – in a round of gossip and confidences – to neighbors and relatives. Whether fresh or frozen, boil the spinach with some salt, drain and press it dry. Sauté spinach in a pan with a splash of extra virgin olive oil and once cool, chop it finely with a knife. 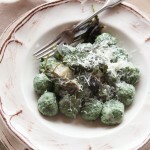 Mix the spinach with the same weight of fresh ricotta and add at least two tablespoons of grated Parmigiano. Season with salt and pepper and a good pinch of grated nutmeg, then add one beaten egg: mix thoroughly. Now make the malfatti. Use plenty of flour to shape small hazelnut-size balls with your hands. The flour will work as a protective film, preventing malfatti from melting into the boiling water. Arrange them on a tray well spaced from each other. Meanwhile, bring a large pot of salted water to a boil and cook malfatti in batches. When they rise to the top – it will take just a few minutes, sometimes it only one – lift them out with a slotted spoon and season them. They are excellent served with butter and sage, or with a simple tomato sauce and a good sprinkle of grated cheese. * Federigo Tozzi, Senese writer 1883 – 1929, is the author of famous works as with Con gli occhi chiusi (With closed eyes) or Tre Croci (Three Crosses). ** Vasco Pratolini, Florentine writer 1913 – 1991, is the author of famous novels (and very beautiful) as Cronache di poveri amanti (Chronicle of Poor Lovers), or Le ragazze di San Frediano (Girls of San Frediano). 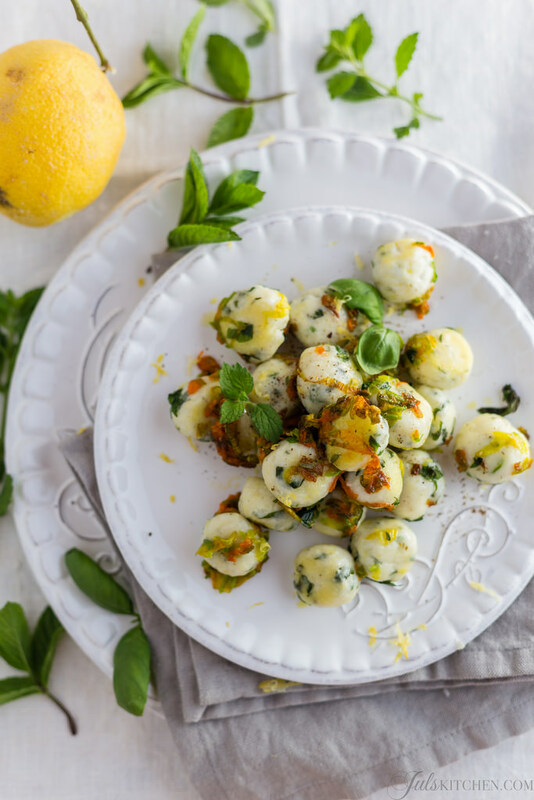 These look fantastic, I can see you are going to encourage me to make my own gnocchi or pasta soon. I need to get back to Italy, we have friends in Florence and it’s definitely our turn to visit them next. I have never heard of this dish before! It sounds amazing. I’m glad that they don’t have to look perfect, because I’m sure mine won’t! Made these tonight and they were wonderful. Thanks for the recipe! Hello, Juls. Can I use frozen spinach for this recipe? As I am not sure I can fiind it fresh anywhere around here. Thanks! Sure, frozen spinach as well! Just squeeze them out carefully!